Benefit analysis of emergency standby system combined with absorption chiller promoted to cogeneration system is introduced. Economic evaluations of such upgraded projects play a major part in the decisions made by investors. Time-of-use rate structure, fuel cost and system constraints are taken into account in the evaluation. Therefore, the problem is formulated as a mixed-integer programming problem. Using two-stage methodology and modified mixed-integer programming technique, a novel algorithm is developed and introduced here to solve the nonlinear optimization problem. The net present value (NPV) method is used to evaluate the annual benefits and years of payback for the cogeneration system. The results indicate that upgrading standby generators to cogeneration systems is profitable and should be encouraged, especially for those utilities with insufficient spinning reserves, and moreover, for those having difficulty constructing new power plants. T. Gonen, Electric Power Distribution System Engineering, New York: McGraw-Hill, 2008. R. C. Dugan, M. F. McGranaghan, S. Santoso, and H. W. Beaty, Electrical Power Systems Quality, New York: McGraw-Hill, 2004. Public Utility Regulatory Policies Act, Report No. 95-1750, Conference Report, Oct. 10, 2001. S. Ashok and R. Banerjee, “Optimal operation of industrial cogeneration for load management,” IEEE Trans. Power Syst., vol. 18, no. 2, pp. 931-937, May 2003. K. Methaprayoon, W. J. Lee, S. Rasmiddatta, J. R. Liao, and R. J. Rose, “Multistage artificial neural network short-term load forecasting engine with front-end weather forecast,” IEEE Trans. Ind. Appl., vol. 43, no. 6, pp. 1410–1416, Nov./Dec. 2007. C. T. Hsu, C. S. Chen, and C. H. Lin, “Electric power system analysis and design of an expanding steel cogeneration plant,” IEEE Trans. Ind. Appl., vol. 47, no. 4, pp. 1527-1535, Jul./Aug. 2011. C. H. Hsu, “A graph representation for the structural synthesis of geared kinematic chains,” Journal of the Franklin Institute, vol. 330, pp. 131-143, Jan. 1992. 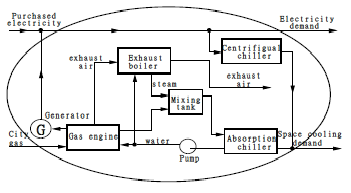 S.-W. Wang, “Benefit Analysis of Emergency Standby System Promoted to Cogeneration System”, AITI, vol. 1, no. 1, pp. 7-12, Jul. 2016.